CETL 2nd Annual SoTL Poster Session. Photo by Kevin Bain/University Communications Photography. 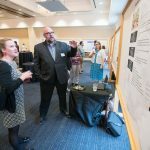 UM CETL invites faculty to present posters describing their involvement in the Scholarship of Teaching and Learning (SoTL). SoTL’s goal is to facilitate improvements in all areas of teaching and learning in post-secondary environments.